I wanted to share a sweet little pillow with you that I had made for my mom this past Mothers Day. 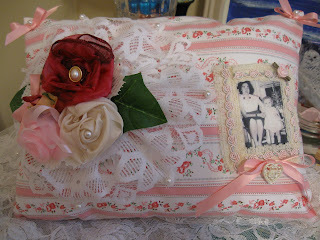 The Ribbon Roses on the pillow are removable so that she could wear it as a corsage on her special day! I had scanned the photo of my mom and I and then copied it onto a fabric transfer sheet. I added some lace and pearls, added a little heart button and some pretty trim around the picture with a tiny pink rose. Mom loves it and has it on her bed all the time. Tell me what you have been up to today!! !